Chris Wilder is full of admiration for Stevenage boss Teddy Sheringham, and says the former England star’s decision ‘to get his hands dirty’ by managing in Sky Bet League Two just outlines his work ethic. Former Manchester United and Tottenham striker Sheringham, who brings his Stevenage team to take on the Cobblers at Sixfields on Saturday (ko 3pm), enjoyed a glittering playing career at both club and international level. He spent the second half of last season coaching the forwards at Premier League side West Ham United, and he could easily have opted to stay working at clubs in the upper echelons of the English game. He certainly wouldn’t have been short of offers. But Sheringham took the decision in the summer to go out on his own in management, and took the reins at Broadhall Way after they parted company with Graham Westley. And that decision, according to Cobblers boss Wilder, speaks volumes about the kind of character Sheringham is. “Teddy is a football man, and he wants to get his hands dirty,” said Wilder. “Top players that do go on to be top managers, they want to know every aspect of the football club. “I think it’s quite easy for those types of managers to go in, and expect the kit to be there, and all the little bits that possibly get done by other people at the top clubs. “But at the lower levels, you have a handle on it and you know how a football club works. As a player, Sheringham book-ended his spells in the top flight by starting out at Millwall and finishing up at Colchester United, and Wilder feels he was always going to go about learning the management trade the hard way. 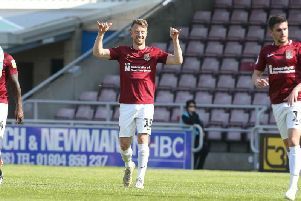 “For Teddy to have the career he has had, from where he started to where he ended up, it was obviously a natural progression to manage,” said the Cobblers boss. “You don’t get that career given to you through talent, there is obviously a massive burning desire, and a passion to work extremely hard, and I know what it’s like. “You have to go and watch games all over the place, and Teddy will be doing that as well. “You can only admire these guys, they are not sitting back on the beach with their feet up, they want to be involved and they have a natural thrill and enthusiasm for the game. Sheringham’s time at Stevenage hasn’t gone as well as he would have hoped, with the team currently fifth bottom of league two. But they drew at title favourites Portsmouth on Tuesday and come to Sixfields on a three-match unbeaten run, so Wilder feels Sheringham is beginning to get things right. “It takes time to put your stamp on a football club,” said the Northampton manager.